Make Easter brunch easy with this recipe for simple and delicious Mini Spinach Quiche! I don’t know about you but Easter sneaks up on me every single year. It’s the rotating date thing. Sometimes it’s in March and sometimes it’s in April, so without a constant date to aim for, I’m often in scramble mode for a brunch menu. 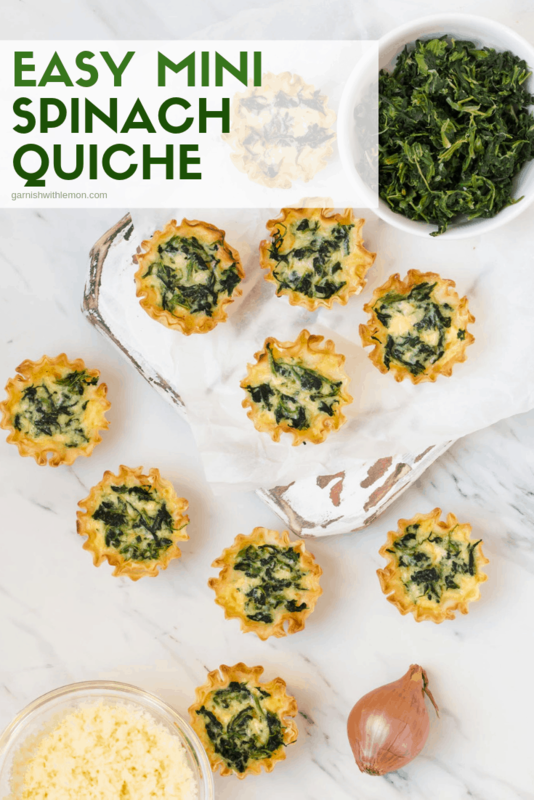 Fortunately I have a few tricks up my sleeve – like this recipe for easy Mini Spinach Quiche – to help me keep my sanity and still make a tasty impression on guests. What’s the difference between a quiche and a frittata? Good question! A quiche is a combination of eggs, cheese and cream (or milk) that is baked in a pastry crust. It usually has vegetables and or meats included in the egg mixture for flavor. A frittata is very similar to a quiche except it is not baked in a crust. Consider a frittata kind of like a thicker baked omelet. 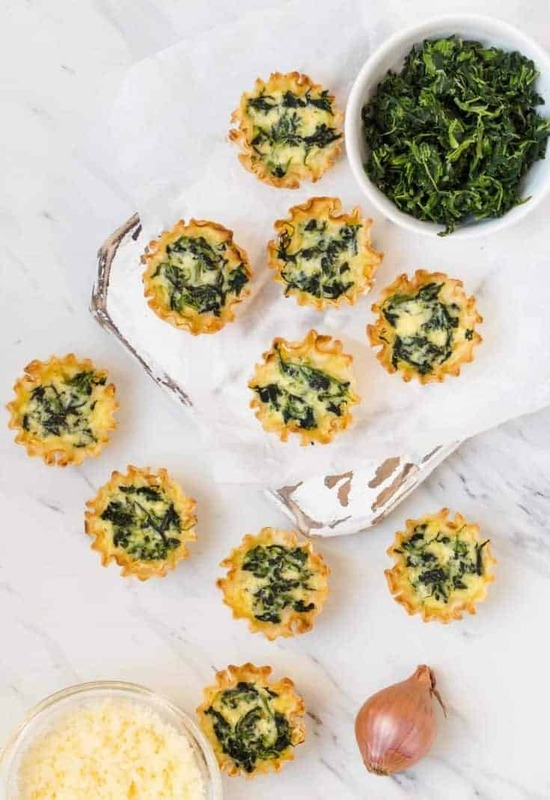 The ingredient list for these Mini Spinach Quiche is short and sweet: shallots, cheese, spinach, eggs, cream and frozen phyllo shells, plus a few extra pantry staples. No need to fuss with a homemade crust, either, thanks to the convenience of frozen phyllo shells. They add just the right amount of crunch to these tasty bites. 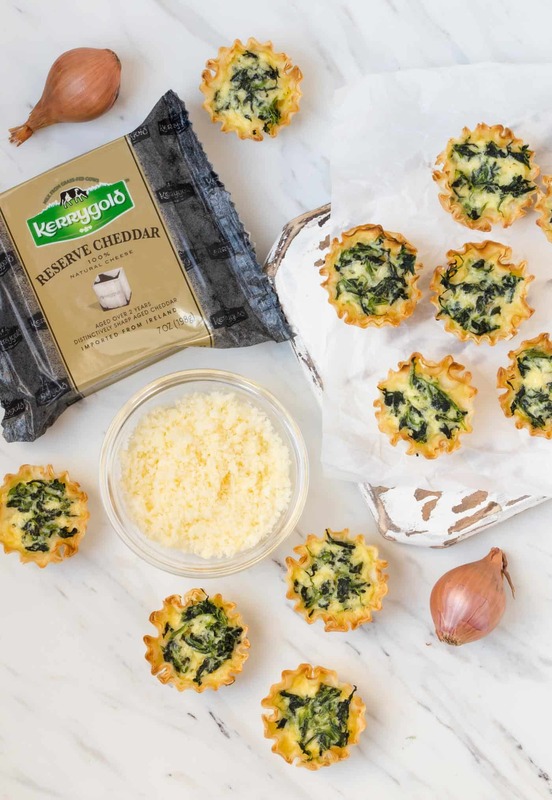 Simply layer the sautéed shallots, grated Kerrygold Reserve Cheddar Cheese and spinach in each cup and top with the egg mixture. Bake for 15 minutes until quiche are puffy and shells are golden. Tip: I swear by these OXO kitchen beakers to make quick work of easily pouring the egg mixture into the individual phyllo cups. The smaller capacity of the beakers makes evenly dividing the liquid a snap. What to serve with quiche for brunch? Pressed for time? You can easily make these Mini Spinach Quiche in advance and serve them at room temperature if you prefer (They are just as tasty.) Add a fresh fruit salad, some of Grandma’s Sour Cream Coffee Cake and a sparkling grapefruit cocktail, and a stress-free Easter brunch is served! These simple and adorable Mini Spinach Quiche will be the star of your next holiday brunch menu. Melt butter in a small skillet over medium heat. Saute shallots until soft and translucent. Set aside. Whisk together eggs, cream, salt and ground red pepper. Set aside. Place phyllo cups in wells of mini muffin pan(s). Evenly divide shallots, cheese and spinach in cups. Pour egg mixture into cups until full. (You may have a bit of egg mixture left over.) Bake for 15 minutes. Serve warm or at room temperature. You'll have part of a block of frozen spinach leftover after making this recipe. The remaining spinach will keep in the fridge for up to four days. Toss it in a soup, a smoothie or add it to this crazy good sheet pan pizza. So lovely and tasteful ! Thank you and happy holidays !